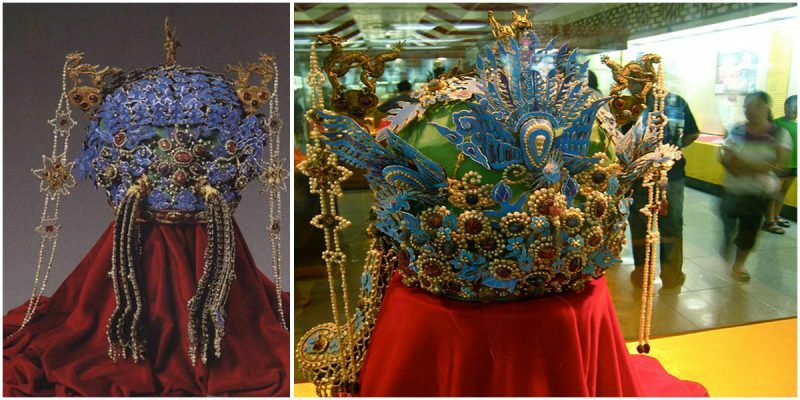 Fengguan, which literally means phoenix crown, is a Chinese traditional ceremonial headgear worn by noblewomen. 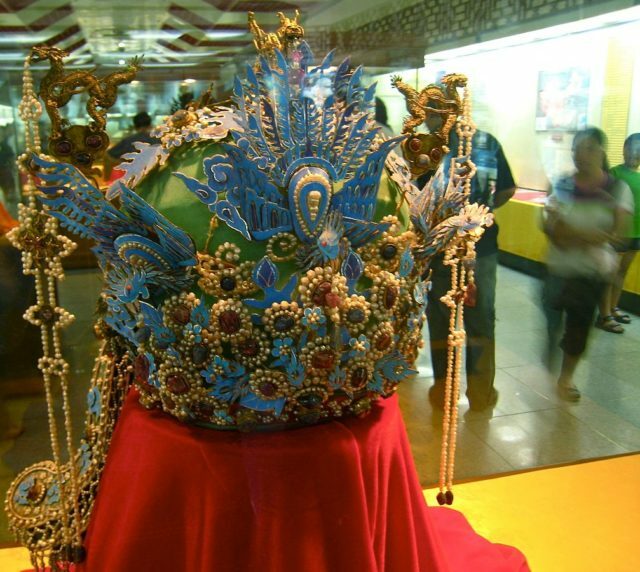 These crowns were first developed under the Tang Dynasty and were worn through the Ming and Qing periods. Many changes were made with time, and from the 19th century, it would be worn either by a bride on her wedding day or by an aristocratic lady on formal occasions, as an indication of her wealth and status. 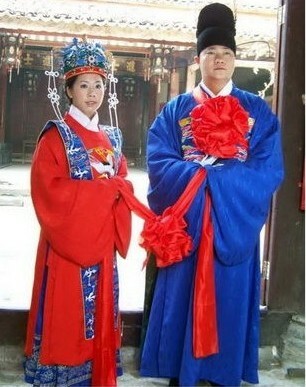 Fengguan of Tang Dynasty worn by empresses. 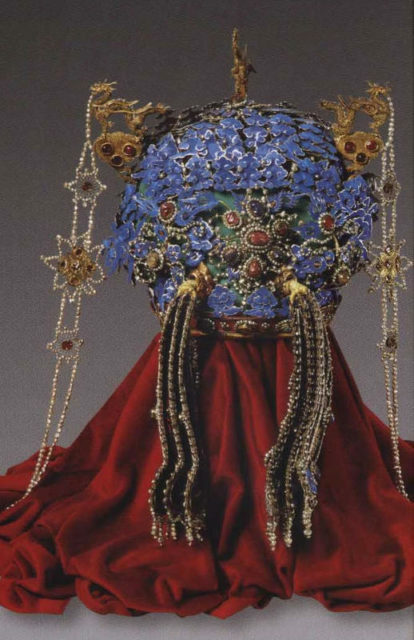 The crown is decorated with gold dragons, phoenixes made with kingfisher feathers, beaded pheasants, pearls, clouds, flowers, and gemstones. The number of pearls used range from 3426 to 5449, while the number of gemstones used range from 95 to 128. 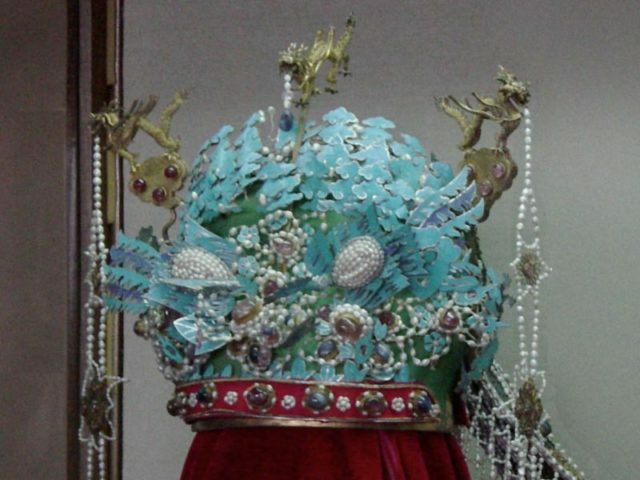 The technique of using kingfisher feathers (‘tian-tsui’) has been mastered in China for centuries. For 2,000 years, the Chinese have been using the iridescent blue feathers of kingfisher birds as an inlay for fine art objects and adornment, from hairpins, headdresses, and fans to panels and screens. 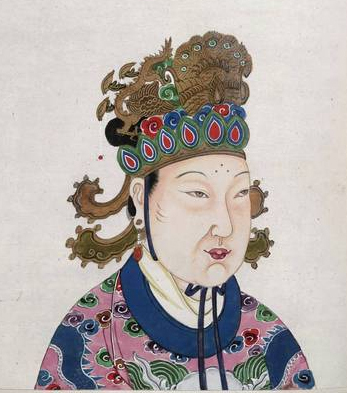 Ming Dynasty empress’s fengguan worn with dashan, with dangling string of pearls by the sides. 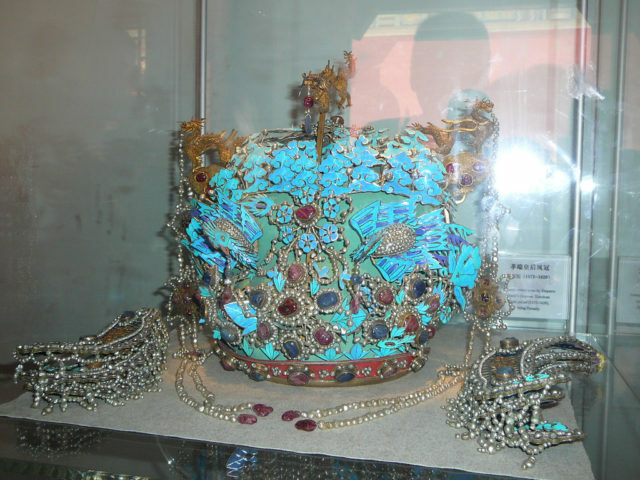 The weight of the entire crown range from 2–3 kilograms (4.4–6.6 lb). Depending on the number of dragons, phoenixes and pheasants, and the presence or absence of certain ornaments, there are different varieties of fengguan. 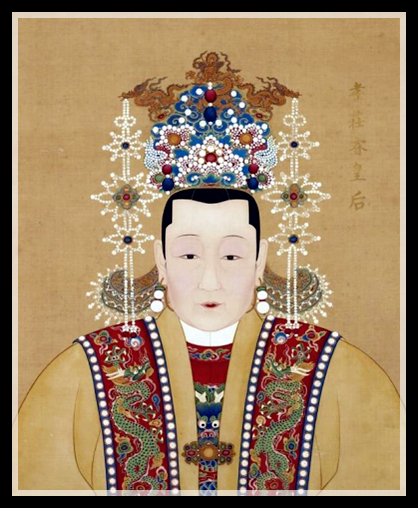 For example, the fengguan of empresses includes the 12-dragons-9-phoenixes crown, 9-dragons-9-phoenixes crown, and the 6-dragons-3-phoenixes crown. These were worn only during important events: obtaining the title, visiting the Ancestral Temple, and receiving ministers. 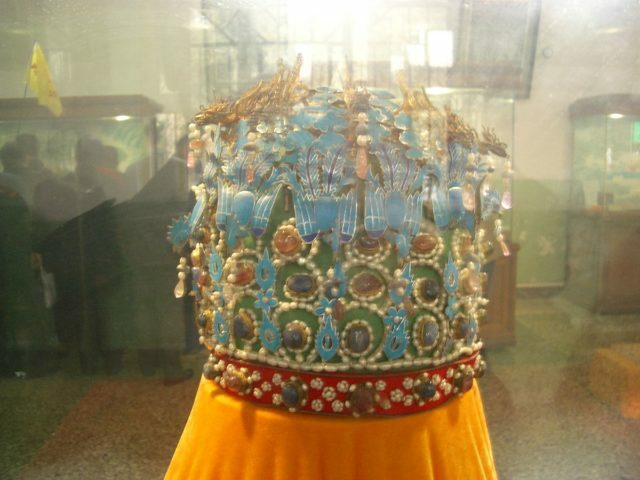 The fengguan worn by royal concubines and princesses (includes wives of princes) included the 9-pheasants crown, 7-pheasants crown, and 5-pheasants crown, which was adorned with beaded pheasants and gold phoenixes, with the number of pheasants representing the wearer’s royal rank. 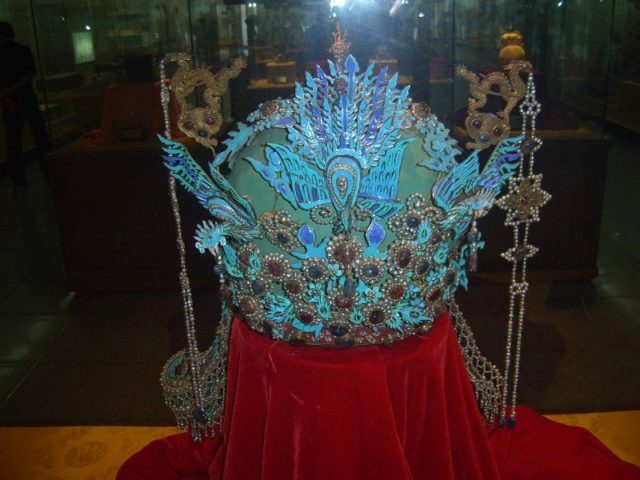 Artifact of Ming Dynasty empress’s 3-dragons-2-phoenixes crown, back view. Unfortunately, not many kingfisher-feather ornaments from the early age survive to this day, as they are notoriously favored by certain small insects. The art of ‘tian-tsui’ which literally means “dotting with kingfishers”, died in the 1940s, but some pieces may still be found in Europe and in America.